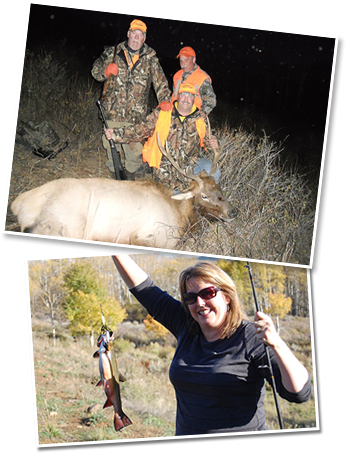 Brush Mountain Ranch is a family owned and operated guest ranch located in the northwest corner of Colorado – high atop the Continental Divide. The ranch features vast open spaces where the 10,100′ elevation mountain provides a spectacular backdrop for elk and deer, and offers some of the most fulfilling and challenging outdoor hunting you will ever experience. Our property consists of 9,800 acres, and provides exceptional fishing opportunities as well. Take a minute and browse our website. Please use our contact page and send us a message. If you would rather talk to someone directly, please feel free to give us a call at (970) 326-3189. Make plans to visit Brush Mountain Ranch and discover the American West in all its splendor! We hope to hear from you soon. The most unique hunting experience you will ever have. Individuals, couples, families and groups come back year after year! Our rustic lodge, cabins and yurts are comfortable and designed to enhance your outdoor backcountry experience. The ranch also has modern conveniences and internet should you need to stay connected.